As promised, I will now share my sausage gravy recipe with you. I developed my gravy-making skills fairly late in life because, for whatever reason, we didn’t eat much gravy at home growing up. In fact, the only time I remember eating gravy at all was during Thanksgiving and Christmas dinners. But those weren’t cream gravies. It wasn’t until I got married that I learned anything at all about cream gravies. I’ve talked a lot lately about comfort foods and to my husband, comfort food means gravy. He loves meals like fried chicken with mashed potatoes, cream gravy and corn. He also like biscuits with sausage and cream gravy. Well, I’ve never fried a chicken in my life so he has to go home for that type of meal, but I’ve learned how to do one thing right: biscuits with sausage gravy. It’s taken a lot of trial and error to get a good cream gravy. It’s not a difficult thing to do. The problem is that so many cream gravies are really bland. I used to think there was some big secret to getting a great-flavored gravy. The truth is, you just have to add enough salt and pepper. That’s it. That’s the big secret! You can of course add other seasonings if you wish. I sometimes like to add a little fresh or dried sage when making sausage gravy and I’ve included sage in the recipe below. But the truth is, you can get a really great tasting gravy with salt and pepper as the only additional seasonings and if you aren’t a fan of sage, feel free to leave it out. I’ve ruined so many batches of gravy trying to find the right seasonings. I’ve tried garlic and onion powders, seasoned salt, worcestershire sauce, you name it, I’ve added it to my gravy. But it always ended up with an odd flavor. And without the extra seasonings, it just tasted bland and doughy. The problem was that I wasn’t adding enough salt. I used to be pretty timid when it came to adding salt. I’d heard so many times that you can always add extra salt but you can’t take it away! I was so afraid of ruining something by oversalting it that a lot of the things I cooked were just too bland. But I’ve learned that it’s okay to keep adding salt as long as it’s done in small amounts. Just keep tasting and salting. You’ll know when it’s right. My method of making gravy is a little different than most I’ve read about. Most recipes will have you crumble and cook the sausage in a skillet, take the sausage out, measure the fat, mix in the flour, whisk in the milk and then stir the sausage back in. I can understand the reasoning behind this. Most people think that to avoid lumpy gravy, you need to whisk the milk and flour together. If the sausage is still in there, how can you whisk it effectively? Well I’ve learned that another way to avoid lumps in your gravy is to simply heat the milk before adding it to the flour. If you do this, you don’t have to whisk anything, regular stirring will be fine. Since I don’t have to worry about whisking, I just mix the flour right into the sausage and then pour the milk in after the flour has cooked for a couple of minutes. There are two bonuses to this method of gravy making. Since you don’t have to remove the sausage, you don’t have to get any extra dishes dirty. And the second bonus is that by using warm milk your gravy will thicken faster since you won’t have to wait as long for it to come to temperature. Now I will answer a couple of questions that might come up after you read my recipe. First question: why do I cook the sausage in extra fat? Isn’t sausage fattening enough already? Well, yes, I suppose it is! But since this is a large batch of gravy and I am using a large amount of flour, I needed to add the extra fat to keep the fat/flour ratio somewhat balanced. I add the oil/butter at the beginning because I think it helps to get the sausage browning faster. But the main purpose is for all that flour to have something to mix into. Second question: why do I specify using one tablespoon of oil plus one tablespoon of butter in the absence of bacon grease? Well, bacon grease is going to give you the most flavor here. But if you don’t have any lard or bacon grease on hand, butter would be my next choice. The problem is that butter burns easily. Mixing the butter with the oil gives it a higher smoke point meaning you can heat it to a higher temperature before it starts burning. If you have any other questions about the recipe or want to share some of your own tips about making sausage gravy, please leave a comment! Edit (9/25/07): I just changed the recipe below to specify whole milk rather than the less descriptive ‘milk’ I had originally suggested. 1. In a medium saucepan, heat milk over very low heat, stirring occasionally. Make sure to keep an eye on the milk, don’t let it boil. 2. Meanwhile, in a large skillet (preferably cast iron), heat the bacon grease (or butter and oil) over medium high heat until melted, then add sausage. Crumble and cook the sausage until well-browned and no longer pink. 3. Sprinkle flour over the sausage and cook, stirring, for a minute or two. 4. Add warm milk all at once and cook, stirring, until thickened and bubbly. 5. Turn heat all the way down, add sage (if desired) and season well with salt and pepper, stirring and tasting frequently until the flavor is to your liking. Turn off the heat. Gravy will continue to thicken as it cools. Serve over warm biscuits. Hope you enjoy your biscuits and gravy! Now I’m off to start making some healthier foods! I love biscuits and gravy! If I was splurging on my diet this would be my favorite breakfast! Thanks for the tips. I've never made this before. Buiscuits & gravy are a southern thing and I have get try this stuff......i love "mopping up" food! I have been seeing biscuits and gravy a lot lately - oh how I wish I would have time to make a breakfast like this in the morning!! Maybe we'll be having it for dinner! Nicole, I don't do the whisking, etc., either. I add flour right in with the sausage to brown it before I add the milk at all. I've never had clumps that I can remember... or at least they get confused with the sausage enough that no one notices! One thing I learned this weekend, though; it's not easy making a plate of biscuits and gravy actually look good! P.S. Thanks again for my household's new standard biscuit recipe! I had one this morning with some apple butter... Still great! Wow it's great to get so much immediate feedback! Kalyn: It can't hurt to eat some every once in a while ;-) Peter: I love 'mopping up' food too! Deborah: I see nothing wrong with eating this for dinner! Curt: I noticed on your biscuits and gravy post that we have similar gravy-making methods. I would love to try it sometime with the smoked sausage...sounds so good! Becky: I'm glad the Q&A helped! I always think it's easier to follow a recipe if you understand why you're asked to do things a certain way. Looks yummy! I didn't grow up with biscuits and gravy either. For me it was tortillas and salsa, but I do love gravy whenever I get the opportunity. This recipe looks delicious. Thanks for all the helpful hints which will make this a "must try" recipe here at my home. Ruby: Haha...yes, I love it too! I cook/eat a lot of things now that my parents didn't really cook. piealamona: You're welcome! I decided that since I appreciate 'tips and tricks' when I can find them, the least I can do is pass them on to others! Kathleen: Thanks, that's a wonderful compliment! I hope that you'll let me know when try the recipes! I haven't had cream gravy in ages! We had gravy often but not the 'cream' kind. And I love sage so I would use lots. Funny, I've just started using salt myself... amazing stuff! girl~ you've got it right. The secret to good gravy is the grease. the saying is..."If ya caint say gravy say grease" Lots of pepper, and some over done coffee makes it yummy! That looks really good. I have not tried to make gravy yet. This is now on my list to try! The bacon grease sounds like it would add a great flavour to the gravy. Mmmmm, That sure looks grrreat! -Yon, The Wurst Show. Yum! I'll add this to my must-try list. Would go great with my freezer biscuits! Nicole - You opened the door so please go ahead and walk-through with a fried chicken adventure. Remember plenty of salt, the cast iron skillet, plenty of salt, high heat at first, and ... oh, plenty of salt. Thanks! Nicole--You're absolutely right about salt. Like you, I tend to be too timid with the salt shaker. But often adding more salt will suddenly bring the flavor to life. Not just of gravy, but of many dishes. Okay, here I am speaking dispassionately about the benefits of salt. Mainly, though, my mind is on sausage gravy overload. This sounds amazing, my friend! Hi everyone, just a quick note! If you look at the gravy recipe again, you will see that I have specified using whole milk. I wasn't specific the first time around, but I always use whole milk in my cream gravy. Katiez: It's funny, considering the name of my blog, that I haven't talked much about salt until now. I think I feel a new blog post brewing ;-) Sandy: I've heard something about adding coffee to gravy (or making coffee from gravy) but have never tasted it. It sounds a little strange but I'm sure it works! Kevin: Bacon grease adds great flavor to everything :-) Yon: Thanks, Yon! Your show looks interesting, I'm going to check it out more later! Alexandra: You're right, the gravy comes together really quick so by the time your oven is preheated and the biscuits are baking, the gravy will be ready! Steve: We'll see. I'm just not a huge fan of fried chicken myself. I tend to like all of the side dishes much better than the chicken itself ;-) Terry B: You're right. While it is definitely possible to over salt a dish (I did it the other day, actually), I think that I could have saved so many 'not-so-great' meals over the years if I would have realized that they just needed a little more salt! Mmmm-mmmm! I love biscuits and gravy far more than my wife or my belt would prefer! :) Speaking of the wife, I wonder if I can talk her into making some! LOL! I like biscuits, and I like gravy. Sounds like a good combination. It was either going to be sausage, gravy and biscuits or breakfast tacos for brunch this Sunday. Your post has caused me to sway in the direction of the gravy and biscuits. Thanks! 100% perfect. I usually nit-pick recipes, but you got it awesome good. I approve! I grew up on this stuff. My mom made white gravy and biscuits to go with the sausage and eggs in the morning. Now, if I make it, I do it your way, and make it for supper. Instead of eggs, I make grits and vegetables. Gravy is about the only thing that I add salt to, when I cook. It definitely brings out the flavor. This is one of my absolute favorite comfort foods. A guilty pleasure as well :). Your photos leave me drooling in anticipation! Justin' s grandmother Webber used to gently saute peeled granny smith apples in butter until soft, not mushy. Then sprinkle a little brown sugar on top, let it melt. Then cover the apples with sausage gravy. The gravy was full and rich. She used a little worchestershire in hers as well as the sage. Try it. It grows on you. Boy do these look yummy... is there a better comfort food?! Thanks for the link to my vegan version - everyone should be able to enjoy this classic. Gently saute granny smith apples in butter. Lightly sprinkle with salt and a little black pepper. Then sprinkle brown sugar to talse. Apples should retain their tartness. Then cover with sausage gravey. An old Webber-Hamaker receipe. My mother used to use left over bacon drippings for the "shortening" in her baking powder biscuits. Yumm. My family is big on the comfort food too! Biscuits and gravy is a family staple in my house. I couldn't agree more with your experience on spices- I think keeping the gravy simple is the real trick. But I've actually found something that really works great (well, I think anyways...). I add ground mustard to my gravy- it adds a really nice rustic flavor without overpowering. I use turkey sausage because I don't eat beef. My family recipe also includes slicing up hard boiled eggs as an addition towards the end. They actually taste great in there. I finish it off with a cheat (but they're SO gosh darn easy)- I use Schwan's herbed cheese biscuits. Makes for a perfect rounded out breakfast. Thanks much for such a fun blog to read! Georgene: Here's what I would do if the gravy is way too salty. Mix two cups of milk with 3 tablespoons of flour (either whisk it together or shake it in a jar). Start whisking the milk into the gravy a little at a time, tasting as you go. When it starts to taste right, stop adding the milk and cook the gravy until bubbly and thickened again. Hope this helps! This recipe looks really great but like you, I've always been very timid with salt. I was wondering if you could give me an idea of how much salt and pepper you would put in this recipe. 'To taste' is too vague for someone like me...I need specifics if you don't mind. Thanks. Yours is the only one I found which included a spice in the gravy... thanks! The sage is great... just wondering if there are any other additional spices you would recommend? A cold Texas night and we had biscuits and gravy for dinner! What a wonderful smooth gravy recipe - it actually looked pretty - I used turkey sausage and added some cayenne to ours - thank you!! In the past my gravy attempts have been nightmares! Nicole, This sounds so good. It will be part of the dinner tonight. My daughter and husband love biscuits and gravy. I can't believe that I have never made it. I just started thinking about dinner tonight and biscuits and gravy came to mind. I saw your site and thought it sounded awesome. Well, I can let you know tomorrow how everything turned out! As for the salt, I have always been conservative when it comes to salt, but I have also learned, certain foods just taste better with the proper amount. So, now scrimping tonight!! I find it very frustration to subscribe to your email service. I typed the letter in and it kept asking for more and more. After about 6 time I had enough trying to subscribe to your rediculas email service. Try cooking something up better. Tried the receipe and it was super. Loved it and will do it again!! The best part was that it was so easy!! i'm so happy i just found your website! i'm from texas and biscuits and gravy is a food group, but i've never made it, so i was searching for recipes and found yours. i was also delighted and very jealous to find out you lived in sicily for 4 years. i had a trip planned in march but unfortunately couldn't go...anyways, will definitely be back to pinch my salt for more! Great recipe. the bacon fat mix with the pork sausage makes a huge diffrence in the flavor, just don't make this a daily ritual or you'll be visting your cardiologist for a cleaning. I use a can evaporated milk. I learned that from the Southern ladies. It's creamier and thicker than reg/whole milk so you don't have to use as much oil. Killer blog. Peace. OMG I just read more of the comments ( I am known to jump in before I read everything) and Did someone just write about BACON GRAVY ???!!! I actually just made it this morning. My kids and I love bacon gravy my husband? Not so much , he won't even try it. My stepdaughter tried it this morning and loved it ( mind you she has been my stepdaughter for about 16 years) I guess it takes some longer than others to come around, But hey at least she finally tried it right? Bacon gravy is the BEST! Ok maybe not real healthy but certainly tasty. My son was home from college and he said the magic words to get any Mama up and in the kitchen rattling those pots and pans. He said " Mom, I'm hungry" OMG MY poor boy. So, between the sticky buns I proofed last night and the biscuits and gravy for breakfast and the homemade bread and rump roast for dinner, I can honestly say I am all cooked out and he is satisfied. Until the next time he is home and most certainly hungry again! I just stumbled across this website while searching for steel cut vs. rolled oats. I am a recipe fanatic, love all things food and am currently studying dietetics. I've had a passion for cooking for more years than I'd like to admit. In 1987 the Frugal Gourmet published a book titled "The Frugal Gourmet Cooks American". This is where I first learned the technique of adding flour to the cooked sausage and then the warm milk for lump free gravy. It is an extremely easy process and always consistent. I have since started using whole wheat pastry flour and 1% milk to bulk sausage with sage for equally satisfying results, adding more fiber, and a bit less fat and calories. Every little bit helps when it comes to cutting back calories and fat without compromising flavor. 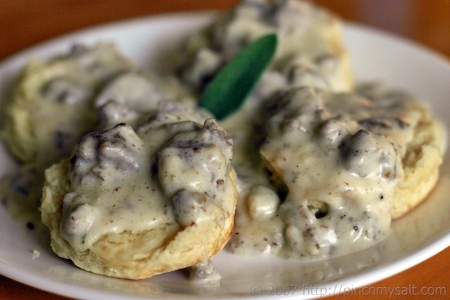 Have always added sage to my biscuits and gravy.. making some right now it's our Sunday morning staple.. Years ago I ate some sausage made from pronghorn antelope, and since their diet consists of lots of sage the meat is very sagey.lol I liked it.. I'm making biscuits and gravy for 30 this week. Do you know how many servings your recipe typically makes? It sounds easy and delicious! I love making bacon or sausage gravy with Biscuits but if I don't have bacon or sausage in the house then I will use hamburger meat!!! Hamburger gravy and Biscuits is so awesome for dinner!!! You make it the same way how u make the sausage gravy, but with hamburger meat!!! It's really good! !